Calculated Risk: Part 3. 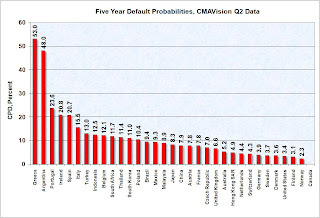 What are the Market Estimates of the Probabilities of Default? Part 3. What are the Market Estimates of the Probabilities of Default? There are a number of ways of looking at chances of default and/or expected losses, including: bond yields vs a low or no default bond in the same currency, credit default swap prices, bond ratings, and analysis of underlying financial factors. Bond ratings move more slowly than bond yields or CDS prices. Ratings often are lowered only after a major problem has been realized and is already incorporated into yields or CDS prices. While bond prices can be useful, there are an assortment of problems of trying to extract default probabilities. One is the yield curve, and that for many sovereigns there aren’t all that many maturities outstanding. Trying to get a 5 year probability of default from a dataset including only a 2 year and 20 year maturity presents some analytic problems. Bond prices also have a surprising amount of differences due solely to liquidity. 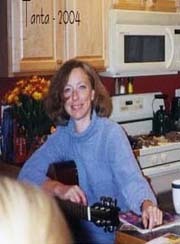 For example see Longstaff. Yes, that’s 15 percent between different US Treasuries and a series of bonds explicitly guaranteed by the US govt, the 1990s Resolution Trust. Even on the run and off the run US treasuries have different yields due to liquidity. Because it provides daily information for almost all large sovereigns, and calculates cumulative probabilities of default (CPD), we use data from CMAVision to estimate sovereign default probabilities. This chart shows outstanding debt with the (CPD) for each country. Despite it having a moderate 8.3% probability of default, Japan’s huge outstanding bond portfolio makes it the largest contributor to expected sovereign losses. However, it’s unlikely that any country would only have a default on a small group of bonds. If Japan defaulted, it is likely that most or all of its outstanding debt would be restructured (e.g., different interest rate, extended payment, a haircut on principal). CPDs from 3/31/10 and 6/30/10 are shown in the next chart. The red bars are Q2, the orange bars are from Q1. Obviously, some credit default swap prices moved substantially in those three months, like Greece, Portugal, Spain and Belgium. As of June 30, 2010, the weighted average expected default rate is 7.4%. 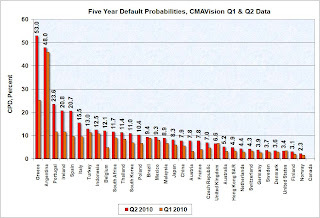 When weighted by value of debt outstanding, CDS pricing worldwide points to 7.4% of it defaulting within 5 years. If the outstanding sovereign debt was still $34 trillion as reported at 12/31/09, that’s $2.5 trillion of defaulted debt. If the trend of increased borrowing has continued to $36 trillion at 6/30/10, it’s about $2.7 trillion of defaulted debt. Before you run out and start shorting sovereigns or panic over your retirement, remember that bondholders seldom lose all of their money on defaulted bonds. Sometimes recovery rates are quite good. Others, not so much. CR Note: This is from "Some investor guy". Over the next week or so, some investor guy will address several questions: What are total estimated losses on sovereign bonds due to default? What happens if things go really badly and what are the indirect effects of default? Later this week: Part 4. What are Total Estimated of Losses on Sovereign Bonds Due to Default?